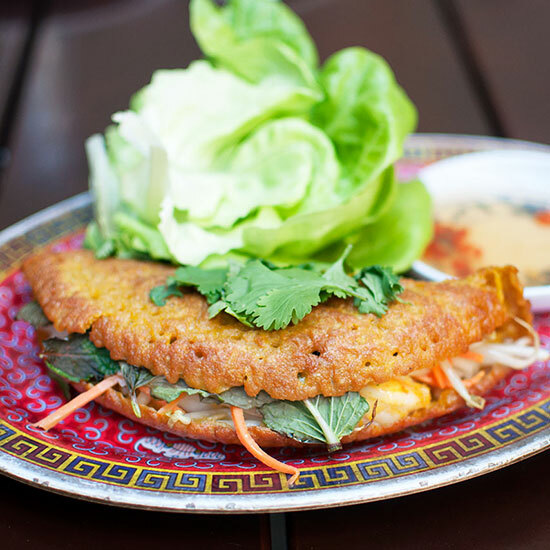 What: If you’ve never dined upon the crisp Vietnamese crepe Bánh Xèo, it’s about time. At Leah Cohen’s Southeast Asian restaurant Pig & Khao, it’s a killer brunch dish-slash-hangover cure — a sizzling golden brown crepe folded over a pile of shrimp, bacon, and bean sprouts, with the citrusy-savory Vietnamese dipping sauce nuoc cham. Wash it down with: Continue with the Southeast Asian theme with young coconut water — with or without a good pour of rum.